Steve Evans was a keynote speaker and Q&A moderator at the first WFSGI World Cycling Forum 2017 on 7-8 June 2017 in Porto, Portugal. Steve also provided the welcome and the wrap-up and summary on both days. 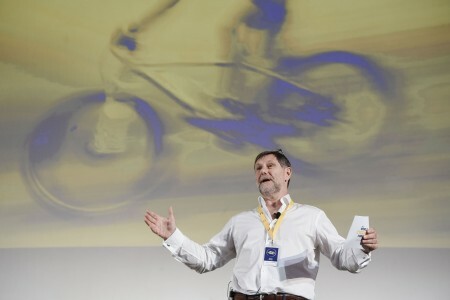 The World Cycling Forum main theme – consumer centricity and increasing speed to market - was addressed by presentations from academics and representatives from various industries, including Adidas, Carlsberg, Porsche and Alvanon. Steve’s talk was entitled Lean Manufacturing: How can Design and Manufacturing Embrace. “Great design and excellent manufacturing are necessary ingredients for success. To be world class they must also work together seamlessly. This is something we find easy to agree with but hard to do!" The session explained some of the techniques used in the very best companies. Reducing time to market, increasing early yield and increasing quality are all possible. Steve shared how good companies have found ways to reduce time to market by 30% or more; how they found ways to introduce new technologies, new ideas and new designs into a busy system; and how they do this with less pain, less iterations, and fewer prototypes.